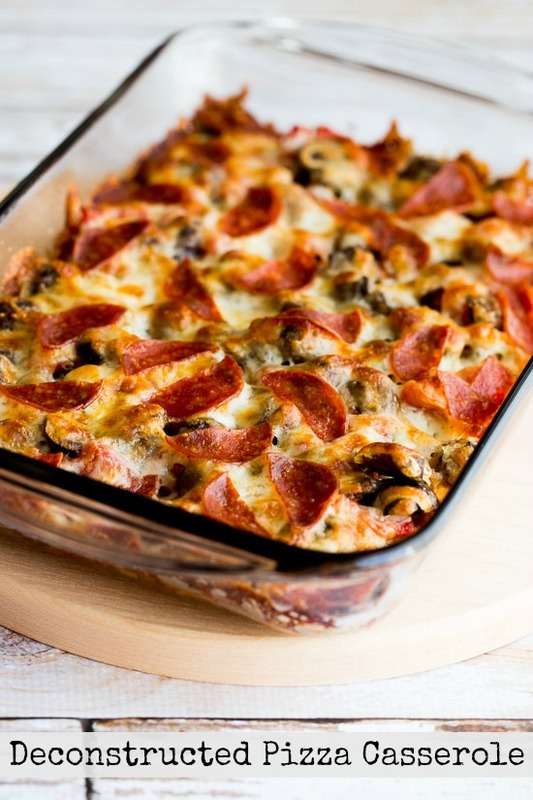 Let's start the year out right with this Low-Carb (and Gluten-Free) Deconstructed Pizza Casserole! I love the first day of a brand new year, and I know that's when many of you are starting with a new or renewed commitment to more carb-conscious eating. So of course on that day I want to start the year with a new low-carb recipe on the blog. And since some people struggle with feeling deprived when they give up their carbs, if I can come up with a new recipe that can be considered low-carb comfort food, that really makes me happy. This year I had another recipe in mind for January 1, but when the idea for this Low-Carb Deconstructed Pizza Casserole popped into my mind yesterday, I just couldn't wait to make it. Then when the casserole was cooking I couldn't wait to eat it, and after I tried it, I couldn't wait to share the recipe with you! I can already tell this is going to be a repeater at my house, and I promise it will be a hit with anyone who likes pizza. Happy New Year everyone! I hope 2016 is going to be a very delicious year for you in every way.